You can specify multiple system identifiers. For example, you might be monitoring Portal, HR and CRM. Now you can search across all of them in a single search. It has always been the case that when you drill into the Performance Monitoring Unit (PMU), by clicking on the tree icon, you would see the whole of a PMU that invoked services from different systems. You can also specify multiple transaction types, rather than have to search each transaction type individually. This is a useful enhancement when searching for a specific or a small number of transaction. However, I do not think it will save you from having to query the underlying transactions table. which has no chance of using an index. This used to cause performance problems when the archive process had not been run for a while and the high water marks on the history tables had built up. Now, the archive process now works hour by hour, and this will use the index on the timestamp column. and (PM_MON_STRT_DTTM) <= %DateTimeIn('" | DateTimeValue(&EndTime) | "')"
There have been some additions to Performance Monitor that suggest that it will be possible to extract performance metrics using JMX. 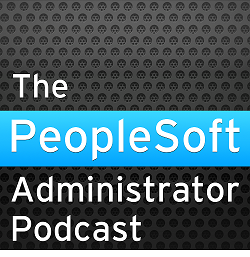 The implication is that the Oracle Enterprise Manager Application Management Pack of PeopleSoft will be able to do this. However, so far I haven't found any documentation. The new component is not mentioned in the PeopleTools 8.54: Performance Monitor documentation. PSPMSYSDEFAULTS - PTPHONYKEY. So far I have only seen it set to 0. Can I setup a dedicated PM environment (tools 8.54.22) to monitor Poeplesoft instances (HCM, FSCM and ELM) that is at lower tools version? For example our FSCM is still at PT 8.53.17, while HCM and ELM has been upgraded to 8.54. Yes, any version of PeopleTools can monitor any version of PeopleTools.